Severe thunderstorms lashed many parts of the country on Wednesday night, killing at least 129 people in the last 24 hours and leaving a trail of destruction, with houses flattened, trees uprooted and electricity poles in disarray. The maximum devastation occurred in Uttar Pradesh and Rajasthan, where the storms claimed 112 lives. UP reported 73 deaths, of which 46 were in Agra alone. As many as 39 people died in Rajasthan, followed by seven in Telangana, four in Uttarakhand and two each in Delhi, Jharkhand and Punjab. The fury of unusually strong winds and heavy rains lasted for up to three hours on Wednesday night, but the extent of damage was known only on Thursday. “Concrete houses came down like a pack of cards one after the other. Trees, streetlights and whatever stood taller than a few feet was flattened by winds. We took out victims from debris and ferried them to hospitals on motorcycles,” Kheragarh police station SHO Narendra Sharma said after spending the night in rescue operations. 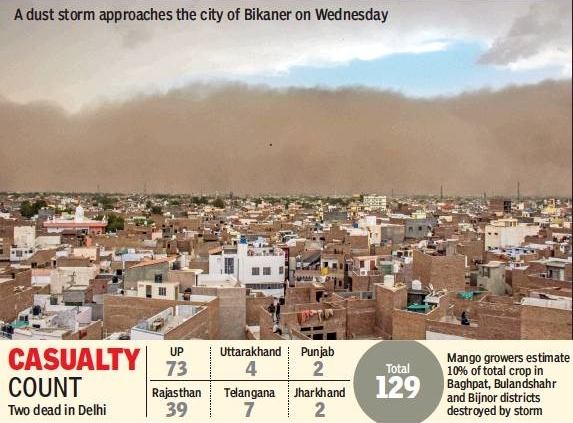 With 24 deaths, Kheragarh tehsil in Agra near UP-Rajasthan border bore the brunt of the storm in the district. Deaths were reported from other parts of Uttar Pradesh too. These included three each in Bijnor and Kanpur Dehat, two each in Saharanpur, Hamirpur, Mirzapur and Kanpur city; and one each in Bareilly, Pilibhit, Chitrakoot, Rae Bareli, Unnao, Mathura, Amroha, Banda, Sitapur, Sambhal, Etawah, Allahabad and Rampur. Nearly 90 people were injured in the storm. The Uttar Pradesh government has announced a compensation of Rs 4 lakh each for the families of the deceased. In Rajasthan, home minister Gulab Chand Kataria put the toll at 33 on Thursday, but unofficial sources said it had climbed to 39 by evening. Over 200 people have been injured in the storm which affected Bharatpur, Dholpur and Alwar districts. After a horrifying night, Thursday morning brought in a host of woes as people woke up to disruption in water and power supply. As many as 12,700 electricity polls were uprooted and 1,523 transformers damaged in the three districts. More than 50,000 trees were destroyed. The Rajasthan government rushed ministers to the three affected districts on Thursday while chief minister Vasundhara Raje is scheduled to visit the affected areas of Bharatpur on Friday. 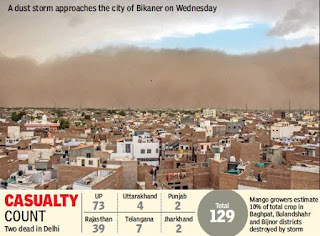 “Seventeen persons have died in Bharatpur, nine in Alwar and five in Dholpur district due to the dust storm,” Kataria told reporters. In Uttarakhand, casualties were reported from Almora, Udham Singh Nagar and Haridwar districts. In Telangana, heavy rains triggered by a cyclonic circulation killed seven people across the state. Strong winds plunged many areas in Hyderabad into darkness. Deaths were reported from Hyderabad, Ranga Reddy, Nalgonda and Warangal districts.